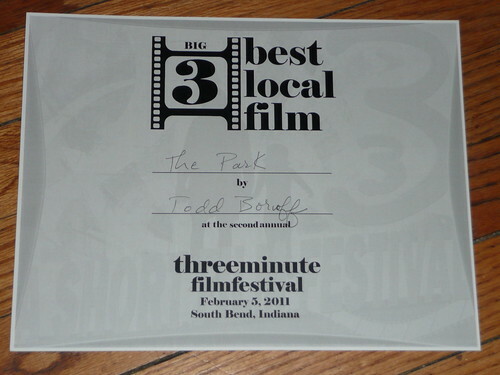 "The Park" just won Best Local Film at 3 Fest in South Bend, Indiana! I'm thrilled! I got lots of great compliments from people after I won. Here's a short animated film I saw recently and really enjoyed. It's a simple story with no dialogue, no narration, and no real sense of who this spaceman is. Yet somehow, through the music and the expression of the characters, I was totally drawn in. I liked that the story came full circle but didn't try to explain everything. This made for a satisfying ending but left me thinking about it the rest of the day. Welcome to my blog! My next film is in development and I plan to update this blog to keep track of my progress. I'll also be sharing links to interesting articles and films I enjoy. Keep checking back for more info!